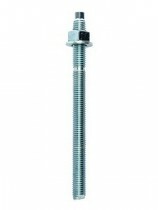 Chemical Anchor studs for use with Glass Capsules or Injection Resin Systems, supplied complete with nut and washer. Supplied in either flat or hexagon ended, these products come in a number of different materials including steel in grades 5.8 and 8.8, both zinc and hot dip galvanised. Also available in both grade A2 and A4 Stainless Steel.